Thank you for your interest and support in this community project and the Alvington Turbine Community Resilience Fund. The society has set up this web page to ensure that the most current information is accessible to both society members and others within the local community to ensure consistency in both the information released and the timing of updates. The 500KW Community Wind Turbine at Alvington is owned and operated by Resilient Energy Alvington Court Renewables (REACR), a Community Benefit Society registered with the Financial Conduct Authority. The turbine was installed on 24th November 2015 with commissioning completed in early January 2016. The turbine is generating clean, green electricity in line with expectations and is well placed to deliver against the society’s social aims over the turbine’s operational lifetime. These include the Alvington Turbine Community Resilience Fund which provides grants to help address current needs and future challenges in the host community of Alvington, Aylburton and environs. Go to the June Update for more details of the fund and a link to the Application Form. Check out the September Update for details of the latest grant recipients. 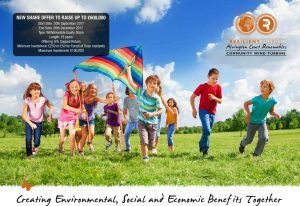 The society is committed to making a positive difference locally in addition to the environmental benefits directly associated with the generation of renewable energy. Resilient Energy Alvington Court Renewables has launched a new Share Offer to give those who missed out on the opportunity to invest in this community project at the construction stage a further chance to get involved. All new REACR shares issued are expected to attract members interest at an average annual rate of 6% (set at 0.75 of the 8% average annual rate that pre-construction investments are expected to receive, reflecting the lower risk associated with an operational wind turbine project). As with previous REACR Share Offers, this Offer is being administered by ethical investment platform Ethex – Full details and access to the Share Offer document (with Application Form) at www.ethex.org.uk/REACR2017. Or by clicking on the image. For people living within the Forest of Dean area, Share subscriptions start from a minimum of £50 as the society wants as many local people as possible to have the opportunity to become involved if they wish. Supporters of the project from further afield are not excluded, but will be required to invest a minimum of £250 in shares. The maximum permitted individual investment in this share offer is £100,000. The society is operated democratically – one member one vote – regardless of investment made. The funds raised through this Share Offer will be used to refinance an existing construction stage loan set at 9% per annum; a loan which the society has been tied in to until recently. The issuing of new community shares will directly reduce operational costs for the society, increasing the society’s predicted surplus income, all of which must be allocated for community benefits as specified in the Society’s rules. REACR is already awarding grants from its Alvington Turbine Community Resilience Fund (based on 4% of turnover) – see details of the latest allocations in the Spring 2018 update. Society surplus will be an additional source of funding for community benefits in the broader Forest of Dean area, with a focus on the GL15 postcode area. The Alvington Community Turbine has been operating well and electricity generation for the year to end of January was 1,059,805kWh. Alvington Parish Council – £5000 towards phase 1 of a proposal for a new multi-purpose community hall and sports facility at Alvington Recreation Ground.The Advisory Panel believes that the planned project will provide a focus for community cohesion and a most useful community asset once built. The funding will support aspects such as conceptual drawings and public exhibitions/community engagement/option plans which in turn will be used to support further grant applications to third party organisations. Summary evaluation of speed calming options considered. Summary of any other grant funding that has been/could be applied for. Details of the findings of traffic surveys carried out in Aylburton. The next deadline for receipt of applications to the Alvington Turbine Community Resilience is 31st July 2018 and six monthly thereafter. Details of Fund Criteria and Application Form are accessible via links on the menu tabs. The current Share Offer (which seeks to refinance the society’s £600,000 pre-construction loan), has raised around 62% of the target to date. Share subscriptions have continued at a steady rate and the REACR board has, therefore, extended the offer giving more people the opportunity to get involved. Shares from the current offer are expected to attract member’s interest at an average annual rate of 6% (75% of the rate of members interest which REACR preconstruction stage shares are expected to attract, reflecting the lower risk of an operational project). Please feel free to promote the opportunity within your networks using the following link to full details of the Share Offer and an application form www.ethex.org.uk/REACR2017. The minimum investment is £250 (or £50 for those who are residents of the Forest of Dean area). Ethex is a positive investment platform which provides services to projects designed to deliver social as well as financial returns. It is administering the share offer for the society. Woolaston School – £2,750 towards the purchase and installation of a new Audio Visual resource for the school hall consisting of retractable screen, projector, speakers and tower unit incorporating microphones, a PC and audio control system. The panel were encouraged that the resource would be used for a number of activities within the school, and also that it would be accessible as a community resource for other groups who utilise the school hall. 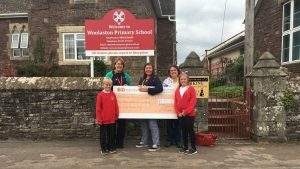 It was felt to be an investment of good value in terms of the benefits to the community, particularly since the school (and after school groups) service families from both Alvington and Aylburton as well as Woolaston. Aylburton Village Hall and Playing Field – £4,750 towards the replacement of play equipment on the Aylburton Playing Field in order to meet necessary ROSPA approval requirements in 2018. The panel recognised that the Aylburton Playing Field is well used and noted the risk of potential loss of this valued community asset if the requirements of ROSPA are not met. It also noted that the Trustees of Aylburton Memorial Hall and Playing Field have already raised £5,200 towards the project costs, from the Aylburton Village Hall Annual Carnival, evidencing good local support. 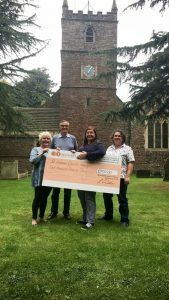 St Andrews Church Alvington – £500 towards the repair and overhaul of the church clock by a specialist clockmaker and horological service engineer. The panel believes that maintenance of existing community assets is a good starting point towards achieving community resilience. It noted that the application relates to repair of a valued community asset on a building of heritage interest. The deadline for receipt of applications for the next funding round is 31st January 2018. The on-line application form must be completed by all applicants and incomplete forms will not be accepted. The purpose of the Community Resilience Fund is to help build community resilience in Alvington, Aylburton and environs by addressing current needs and future challenges. The available funds are limited and the process is, therefore, competitive. Applications to the Alvington Turbine Community Resilience Fund are now invited by the Board of Resilient Energy Alvington Court Renewables Limited. Completed applications will be accepted until 31st July 2017, and six monthly thereafter (deadlines of 31st January and 31st July each year). The purpose of the Alvington Turbine Community Resilience Fund is to help build community resilience in Alvington, Aylburton and environs. Projects seeking funding must address a current community need or a future community challenge, which benefits the communities of Alvington and/or Aylburton and environs. The Application Form is accessible here. Completed applications can be submitted on-line or, may be downloaded and returned by post/email if preferred. If no internet access, telephone 01594 529688 to request a form. The amount available for allocation at this funding round will be £8,000. The cut off for receipt of completed applications is 31st July 2017. Following each closing date, the appointed Advisory Panel will meet to assist the Society by reviewing applications to the Alvington Turbine Community Resilience Fund, against the Fund Criteria. The panel is made up of current residents of Alvington/Aylburton who applied for the voluntary role in June 2017 and have been accepted by the Board of Resilient Energy Alvington Court Renewables. The Advisory Panel will be briefed by The Resilience Centre on the characteristics of resilient communities, in order that they may appropriately evaluate applications to the Fund. Links to further resources on community resilience will also be added to this webpage as the project develops. Eligible applications will be considered by the Advisory Panel in terms of the contribution each project/activity would make towards the aim to help build community resilience. The application process is competitive and available funds at each round will be limited – not all applicants will be successful. The decision regarding allocation of available funds by the Advisory Panel will be final. Feedback will, however, be provided to all applicants. The Application Form is designed to guide applicants and ensure consistency in the type of information provided by applicants. All parts of the application form must be completed. Additional relevant information (such as accompanying quotes or supporting evidence) may be submitted with an Application Form, but should be kept to a reasonable length or summarised. The first Advisory Panel meeting for the Alvington Turbine Community Resilience Fund will take place in August 2017. Successful applicants will be informed by late August/early September, dependent on the date of the Advisory Panel meeting. 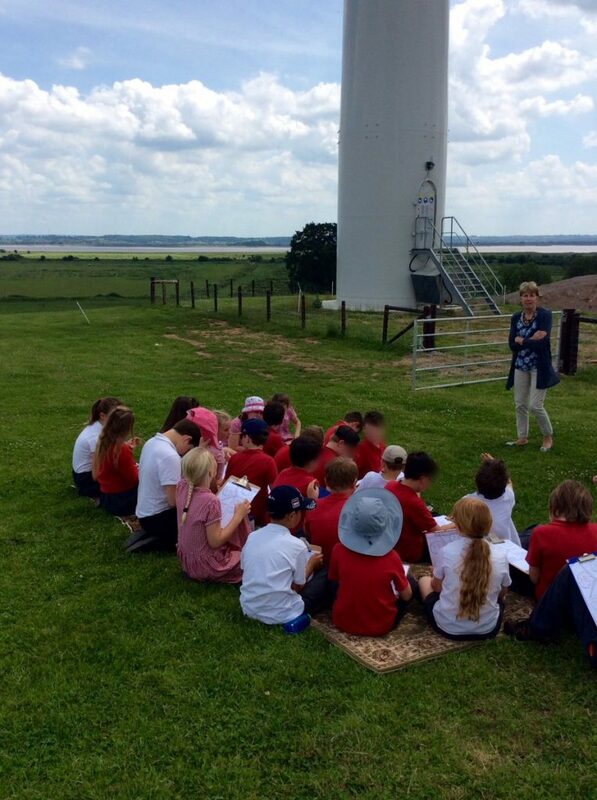 This month we welcomed Year 4/5 pupils from Woolaston Primary School who came to visit the turbine with Headteacher Mrs Yoxall and Class teacher Mr Cox, after studying renewable energy as part of their curriculum. We were impressed by their enthusiasm for the project and the knowledge and understanding displayed by the children in relation to energy matters and the environment. After some searching questions answered and a look inside the turbine tower, the group settled to make sketches of the turbine. We look forward to seeing the artistic output and are pleased to donate a model of a community wind turbine to the best sketch selected by art teacher Mrs Thompson. Applications for a voluntary role on the Alvington Turbine Community Fund Advisory Panel are now invited by the Board of Resilient Energy Alvington Court Renewables Limited. Completed applications will be accepted until 30 June 2017. Applicants must be a current resident of Alvington or Aylburton. There are just 4 questions to answer on-line or you can print and return the form by post/email if preferred. If no internet access, telephone 01594 529688 to request a form. The Advisory Panel will meet twice a year to assist the Society by reviewing applications to the Alvington Turbine Community Resilience Fund, against the Fund Criteria (see February Update for more details). The Panel will decide on allocations of available funding at each round, commencing summer 2017. Successful applicants to join the Advisory Panel will be notified during the first week of July. Initial appointments will be for a minimum of 1 year and a maximum of 3 years. We are pleased to announce that the first deadline for applications to the Alvington Turbine Community Resilience Fund will be 31st July 2017, with six monthly deadlines from then onwards (31st January 2018, 31st July 2018 etc). Application Forms will be available on this webpage from 30th June 2017. If you have no internet access, you can call to request a hard copy of the Application Form from 1st July 2017. 01594 529688. As explained in the February Update, applications will be considered in relation to the published community fund criteria and purpose. Retrospective applications (ie where expenditure has already been incurred) will not be eligible for funding. The process is competitive and not all applicants will be successful at each round. The decision regarding allocation of available funds by the Advisory Panel will be final. Feedback will, however, be provided to all applicants. The Society is now in the process of establishing the community fund mechanisms, with the opening of the first round of applications to the Alvington Turbine Community Resilience Fund expected in early summer 2017. The fund criteria and mechanism of operation are outlined below. The Society has already received a number of enquiries regarding possible applications to the fund in relation to eligibility criteria. Whilst individual responses at this stage are not considered appropriate, it is hoped that the information provided below will provide clarity. Applicants will, however, be required to explain how the funding they seek will help to build community resilience in Alvington, Aylburton and environs and show a basic understanding of what this means. Further links regarding community resilience will be added to this resource as the project itself develops. The Society will be keen to receive applications for projects/actions which will help to create a lasting legacy, providing social, environmental and/or local economic benefits for the community. There will be no requirement for match funding as with some community grant schemes. However, applicants may leverage additional funds by the use of a successful funding award from the Alvington Turbine Community Resilience Fund as match funding for another funding stream. Further details including a link to an on-line application form will be provided in the next Update along with the closing date for the first round of funding applications to be received. The Society believes that those living within the community are best placed to understand the community strengths and weaknesses, and therefore determine its needs. The Alvington Turbine Community Fund Advisory Panel will be established in May 2017 ahead of the opening of the first round of applications to the Community Fund. It will assist the Society by reviewing applications received in each particular funding round, against the Fund Criteria. The Advisory Panel will be Chaired by The Resilience Centre (the Society’s appointed Manager) who will oversee proceedings on behalf of the Society and provide an admin function, but will have no voting rights on funding allocations. The appointed Advisory Panel members will be briefed on community resilience, and at each funding round they will then have the role of assessing the eligibility of applications against the criteria, and collectively deciding on the allocations of funding. The application process will be competitive and not all eligible applications to the Community Fund will be supported. Feedback will, however, be provided to all applicants and, where appropriate, unsuccessful applicants may be invited to submit an application at the next funding round, once feedback has been considered and/or further information to support an application has been provided. Community minded individuals living in Alvington and Aylburton who would like to be considered for a voluntary role on the Advisory Panel, and who are supportive of both the community wind turbine and the aims of the society, are encouraged to email REACR@theresiliencecentre.co.uk to pre-register their interest in receiving details of the application process when it opens. Further details including a link to an on-line application form will be provided in the next Update, along with the closing date for Advisory Panel applications to be received. The selection of the Advisory Panel members will be decided by the board of REACR. Applications will be invited from individuals only ie there will be no nominated representatives of other organisations on the Advisory Panel. Appointed Advisory Panel members may have associations with other community organisations in Alvington/Aylburton and environs, but will be ineligible to vote on applications to the Community Fund received from any organisation with which they have such associations. Whilst the majority of successful applications to the Community Fund are anticipated to be from applicants in the Alvington, Aylburton and immediate surrounding area, applications from further afield may be considered, at the discretion of the appointed Advisory Panel, but only where the applicant can clearly evidence that there would be significant benefits to the communities of Alvington, Aylburton and environs. The Society intends that once the Community Fund opens, applications to the fund will be invited twice a year. The allocation of available funds will be based on 4% of turnover achieved by the Society in the preceding period. The expectations are that the average annual donation by the Society to the Alvington Turbine Community Resilience Fund, over the turbine’s 25 year operation, will be of the order of £15,000 – £20,000. The figure will, however, be less in the first three years of operation due to higher project outgoings during this period, including in relation to curtailment of the turbine’s full potential as part of biodiversity and habitat monitoring commitments required by Forest of Dean District Council. The first round of funding will also be affected due to the delayed commencement of FiT payments by Ofgem (see December Update). Before the Alvington Turbine Community Resilience Fund can be launched, as with any similar community project, the society first needs to receive sufficient income to meet its initial start-up and ongoing operating costs. REACR had anticipated being able to establish the fund after the first full year of operation. Like many other community energy projects in England, however, the society’s income has been significantly affected by prolonged and unexpected delays by OfGem in administering the Feed in Tariff (FiT) scheme, for this and other community projects across the UK. We are informed that this is due to the large number of applications received by OfGem immediately prior to the Government’s amendments to the FiT scheme in 2016. Our prior experience is that the turnaround time for processing of projects, such as REACR, was a matter of only a few weeks. In this instance the processing took 11 months, during which time the society has been unable to claim any FiT income associated with energy generated by the turbine– a considerable sum. During the time our application was being processed, OfGem also changed the rules regarding the effective start date for FiT payments. They announced that the effective start date, for the 20 year period over which FiT payments could be claimed, would change from the date at which a project was certified as exporting to the grid (the policy in place at the time of the REACR application for full accreditation), to the date at which the FiT accreditation was finally verified. Because of this change, unfortunately the society’s initial income from the FiT will be backdated only to 24th April 2016 and not the 24th November 2015. These changes do not affect the long term viability or income overall, since the society will still receive FiT payments for the electricity which the turbine generates for the guaranteed 20 year period. However, the delay to the FiT commencement date has affected the society’s income and cashflow in this first year of operation. Consequently, the start date for the opening of the Alvington Turbine Community Resilience Fund is necessarily delayed. The Society now expects to be able to establish the community fund in spring 2017, with the opening of the first round of applications to the fund likely to be scheduled for early summer 2017. We anticipate that this webpage will be updated in February 2017 with further details of the mechanism for the fund operation, including a call for applicants who wish to be considered for a voluntary position on the Alvington Turbine Community Resilience Fund Advisory Panel which will assist the society in allocating the funds available at each funding round. The average annual community resilience fund available over the lifetime of the project is expected to remain at £15k – £20k/yr. The figure will, however, be less in the first three years of operation due to higher project outgoings during this period, including in relation to biodiversity and habitat monitoring commitments required by Forest of Dean District Council. In addition to the Alvington Turbine Community Resilience Fund, the society anticipates generating a further surplus for the benefit of the community from around the sixth year of operation (exact value to be confirmed). The society intends that this separate community surplus will be allocated for broader social and environmental benefits across the GL15 postcode area. Further information will be provided ahead of the launch of this additional community surplus, the allocation of which will be decided on an annual basis by the members of the society against established criteria.